Advent gets short shrift in modern America, and it shouldn’t. Of all the seasons of the church year, it is Advent that feels most like home to me. Christmas and Easter are holidays, by which I mean nice to visit but you can’t stay. Epiphany is an intellectual and meditative season which are not words to describe most Americans. The long season of Pentecost only takes meaning if we feel like we are living in the Pentecost. But for me I think most of us are “waiting of the consolation of Israel”. It feels like we are living in soccer’s “extra time”. That is advent. And that is what this sermon attempts to do, weaving around Isaiah’s desires for the Lord to “rend the heavens and come down” and Jesus’ Palm Sunday entry into Jerusalem, I have tried to invoke the feelings of separation and drawing near, of desiring repentance, the face of God being hidden, and yet the reign of God is present. 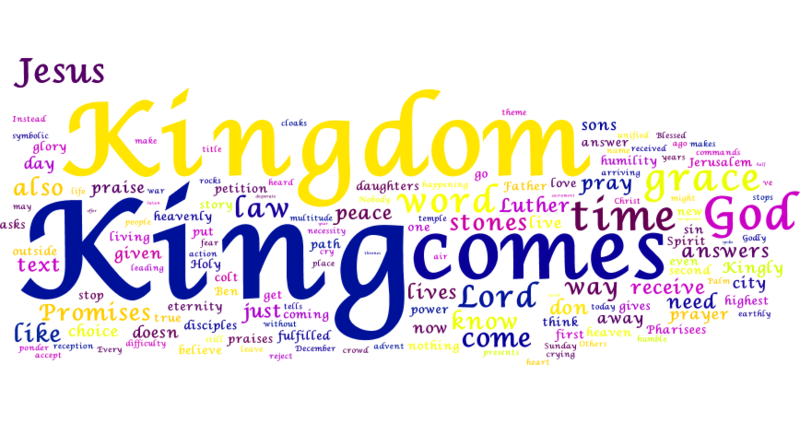 Worship Note: Our closing hymn LSB 348, The King Shall Come When Morning Dawns, captures many of these advent inspiration. It closes out the recording. The season, Advent to be specific but you could say the extended Christmas season, begins for me when I hear “On Jordan’s Bank”. That was our opening hymn – LSB 344. The funny thing is that hymn reflects some of the theological turns that obscure the Baptist’s message. It turns from the direct and present cry of John on the Banks of the Jordan toward a spiritualized understanding. “The Lord is Nigh” becomes “and let us all our hearts prepare For Christ to come and enter there.” Charles Coffin, the hymn writer, was a French Jansenist. What that means is a Catholic Calvinist. The Jansenists eventually were repressed and died out within the Catholic church, but in Coffin and Pascal they remain in the Church Universal. His Jansenism dominates verses 2 and 3, but he returns is verse four to the Baptist’s message which is not a retreat to a spiritual realm, but the coming down of the Lord. 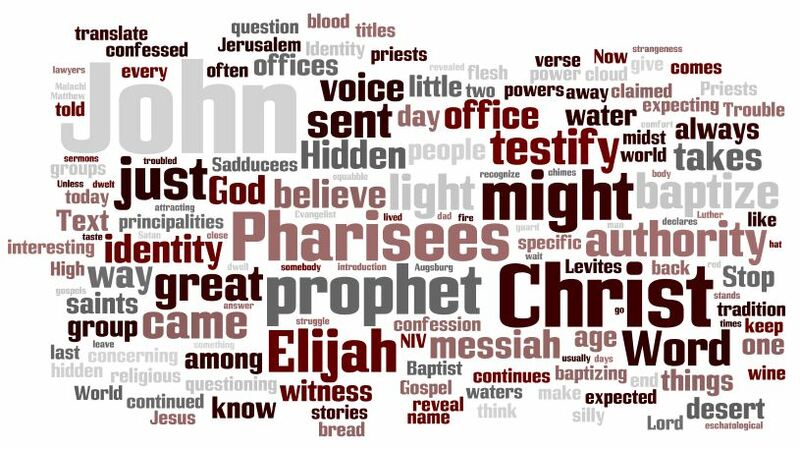 The sermon attempts to get us to hear John the Baptist. True religion is not a matter of choice – something those Jansenists would understand. True religion in the reign of Christ. Today that is the reign of grace. Christ has taken our deserved baptism of fire and given us his baptism. This time the people of God don’t cross into the promised land across that Jordan on dry ground with swords for conquest. This time we cross by water and by our absolute repentance which is our acknowledgement that before the Lord we’ve got nothing. Coming right behind, is the final baptism. The Holy Spirit which we have as the down payment will be set free to recreate everything. Those sealed in the living water shall live, those without perish in the refining fire. The final hymn – LSB 345 – Hark a Thrilling Voice is Sounding is a old Latin hymn that captures well that progression. Hear the Baptist; hear the solemn warning. Today see “the lamb of God with pardon. Let us haste with tears of sorrow, one and all to be forgiven”. Tomorrow, “when next he comes in glory, the world is wrapped in fear, He will shield us with his mercy, and with words of love draw near”. The Lord has treated us with love and solidarity. We have nothing to fear in his drawing near. Come Lord Jesus. In Bible class this past week we were looking at Romans 3. One of the observations was that when Paul really wants to ground something for his audience he quotes the Psalms. Romans 3:10-18 is one long mashing together of lines from the Psalms. The point behind that observation is that it was the hymnbook that anchored most people recognition of the theology. Everybody remembers the songs, or at least the good ones. Each branch of the Christian tree always had there own hymnbook. Within that book were the shared songs of all (Joy to the World, Amazing Grace) and those that were more special to a specific tradition (the 15 verse hymns of Martin Luther like From Heaven Above to Earth I Come). As beautiful I I find “From Heaven Above”, I would not expect a Baptist to know it. I would have expected Baptist and Lutheran to know O Little Town of Bethlehem or Lo, How a Rose E’er Blooming. And even the committed atheist knows Silent Night. I slipped into the subjunctive past there, I would have expected, because while I would have, I’m not sure if that expectation was realistic even in the past. And it is no longer operative today. First because the outlet for these songs is no longer as wide as it once were. As a small boy, the secular radio station in during Christmas would play Carols as specific as O Little Town of Bethlehem or It Came upon a Midnight Clear. Also, it was fading already, but that was a time when non-professionals sang regularly. Whether it was community choirs or Caroling or before any church function or just in the home, people sang. I don’t think that is true anymore, other than getting caught singing along to Katy Perry in the car to embarrass your kids. The only place these songs and singing happens on a regular basis in in church. Now if you are a near every Sunday attender, even if you are skipping traditions, in a few years you will become accustomed and know the songs of that tradition at least to the point of recognition. And again in that subjunctive past, a larger percentage of Christians attended at those frequencies. Once upon a time, the rule of thumb was the ratio of attendance to membership was 1:2. I consider us fortunate to be in the 1:3 range. I know many pastors who hold 1:4 as the new guideline. If attendance is monthly (1:4) there are big gaps. For example, the season of Advent is 4 weeks. There are more, but I would say there are three great hymns of Advent: On Jordan’s Bank the Baptist’s Cry, Hark the Glad Sound and O Come, O Come, Emmanuel. (The Lutheran Specific gem might have been Come, Thou Precious Ransom Come). Talking with the person who is arranging some of the music for one of those Advent Services, she was surprised when nobody in the group knew O Come, O Come, Emmanuel. My reaction was that if your church attendance had been limited to Christmas as a kid why would you know it? And expanding that to the current situation, if you are in service once a month, in December that is probably not that third week (15th – 22th) that is the traditional place for O Come, O Come. O Come, O Come is ancient dating back to at least the 9th century as the antiphons in Evensong or Vespers. A verse a day from Dec 17th to the 24th focusing that last week before Christmas day. The advent Hymnbook, which for me personally is the beating heart of Christian piety and practice (for if we are not in a perpetual advent what are we in), is something that for many within the church is not familiar. Now there are two reactions to this. The first is a general “dumbing down” of the hymnbook. You can do this by capitulating to the culture and bringing in professionals all the time. That is what CCM is. We replicate the radio sound you know, bring it into the sanctuary and have a professional sing it hoping that you will do what you do to the radio. You can also do this by shrinking the hymnbook. By singing the same hymns instead of 1 – 3 times a year singing a smaller number 3 – 6 times a year. If they don’t go with the text or the theological theme of the day, oh well. A third way is simple defiance which is really asking the faithful to keep alive this tradition and practice the faith. And this is where I want to bring in another article and address that third part of my title. 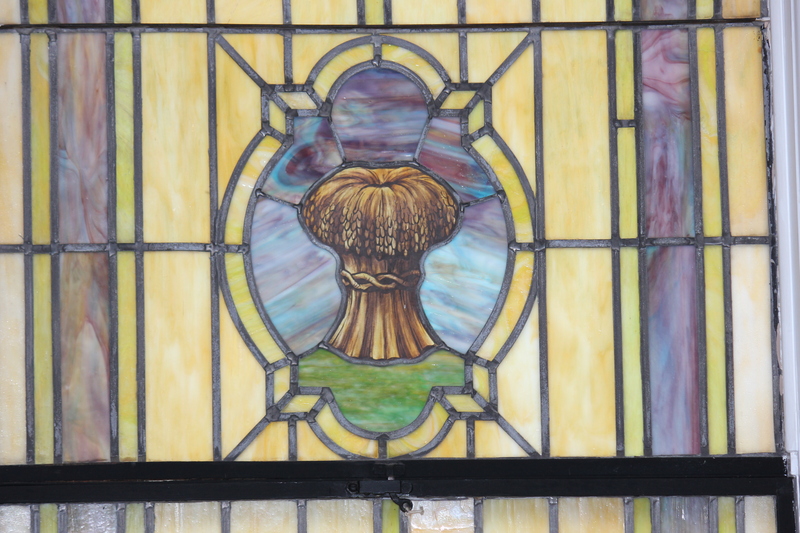 Churches also need to take back some of the responsibility that they shifted onto American culture. Because of the (largely Protestant) religious public consensus in early and 19th Century America, social pressure effectively substituted for ecclesiastical discipline. We can debate whether this cultural arrangement ever worked all that well (as well as what prompted it), but whatever moral consensus ever existed has been strained by the upheavals of post-War American culture. Because of the earlier reliance on social consensus, and the consequent blurring of lines between society and Church, this cultural shift created an ecclesiastical challenge. American churches must now get into the business of distinguishing between themselves and the broader culture in ways that they didn’t in early American history. There was a time when O Come, O Come, Emmanuel I would have placed in the general cultural knowledge like Silent Night. As Dr Rodgers points out, the American church had it easy in a sense. The culture helped instruct in the faith. He calls it ecclesiastical discipline, but what I would call it is the law of practice. What does it mean to be a practicing Christian? The culture used to form and guide people to at least nominal practice. Today, true practice of the faith is counter-cultural. The church and the individual must take responsibility for their own practice. What does this mean? Well, in one sense it can be that stubborn defiance in regards to language and songs. You know you have walked into something different when the hymnbook is used. And it might require some learning. But in a deeper sense, the church is probably going to have to get used to proclaiming a clear law. Membership in American society is not membership or practice of the Christian faith. Spelling out what it means to live your baptism, to receive the body of Christ, and to incarnate that body in your world. The church has been vague for a long time accepting the general societal definition. That definition is now toxic to the true faith. 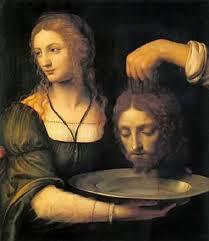 The proclamation of John the Baptist in Luke is catechetical, a big word for it teaches. Being Lutheran one of our stock catechism questions is: What does this mean? Luther asks it all the time and then explains it. The crowds and people who come to John the Baptist ask: “What do we do?” And John answers them. 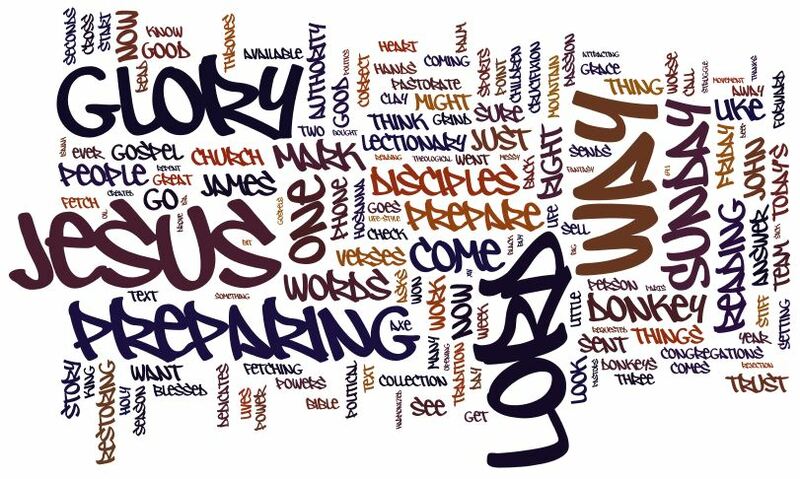 We usually summarize the Baptist under the phrase “prepare the way”. And that is a great phrase, but we need to answer the what. What does preparation look like. Gracefully God has answered through John (and through the apostles). Within that last one is what is sorely missing in our society, people who truly carry out their vocations or callings. We care not at a loss for labor. We are at a loss for vocations in the Lutheran sense. It is not just priests or monks and nuns who have a sacred calling. Fathers, Mothers, citizens, rulers, employers, employees…the list goes one. We all have multiple vocations. Preparing the way includes living our calling and not just trying to drain them of life. 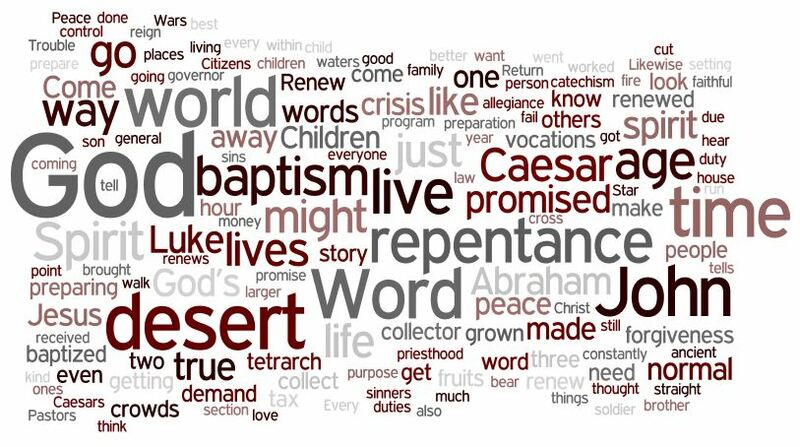 And all of that, because we fail so miserably, leads us back to the desert…to hear the Word…to be renewed. Not of ourselves, but in repentance and by the Spirit. Who are you? That is an identity question. And it is interesting to me that a world that is constantly giving you something to “build your brand” around or upon there is little talk or understanding of identity. Colin Cowherd – ESPN Radio announcer – is one of the most bracing and upfront announcers I’ve heard. Especially in sports where most coverage is “rah, rah” type. He’d hate this, or not have the vocabulary to understanding it, but he’s one of the best moralists on the air. But back to the point. Tebow keeps winning – and keeps making Colin’s almost daily rant look dumb. For the first four weeks of the Tebow run, Colin was all about how this can’t work and all the reasons it can’t. For an announcer who is usually so left brained logical it hurts, you could here the emotion. His accumulated logic and wisdom wasn’t working and he didn’t like it. If he could be wrong about this, what else could he be wrong about. But then he stumbled across a new line – “Tebow knows who he is; you can do a lot, even if you are limited, by knowing who you are.” He’s talking about identity. The world pummels us with appeals to base our identity in titles and positions. Or it entices us and bullies us to forming an identity around cool, or traditions or the right way. What Colin stumbled across, what Tebow and his coach should be recognized for, is that they didn’t listen to the siren calls – “you’ve got to have this type of quarterback/team”. The two groups that came to the Baptist are asking those identity questions. And John confesses. He holds on two the only thing he has – the Word of God – I am the voice calling in the wilderness. He revealed the hidden Word, the hidden savior. He witnessed to the light. We as Christians know our identities. We are children of God. We are the redeemed of Israel. And like the Baptist we have been sent into the world to reveal the hidden Lord. And all we’ve got is the Word – a simple confession. This coming weekend on the Church calendar and the secular calendar covers a bunch of ground. 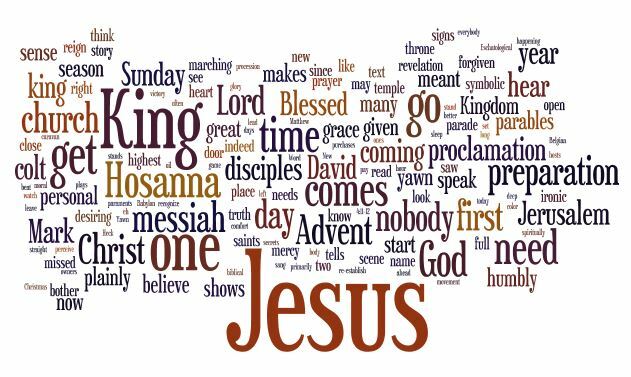 This is the last Sunday of the church year often called Christ the King Sunday. The Sunday is set to ponder the last judgement, the coming of Christ with full authority displayed before all. At St. Mark’s it is a communion Sunday. We celebrate the Lord’s Supper on 1st, 3rd and 5th Sundays. The following Sunday, being the start of Advent, starts a penitential season of the church year or a season of preparation. Taking on that more somber tone, the Alleluias are removed. And bleeding over from the secular calendar is Thanksgiving. We have a Thanksgiving service on Wednesday evening, but it usually gets at least a nod in the Sunday prior. We won’t be singing this hymn (tune, text) – #633 in the Lutheran Service Book – as the Hymn of the Day. Instead it is going to be after the Supper. But it really brings together all three threads of the service. 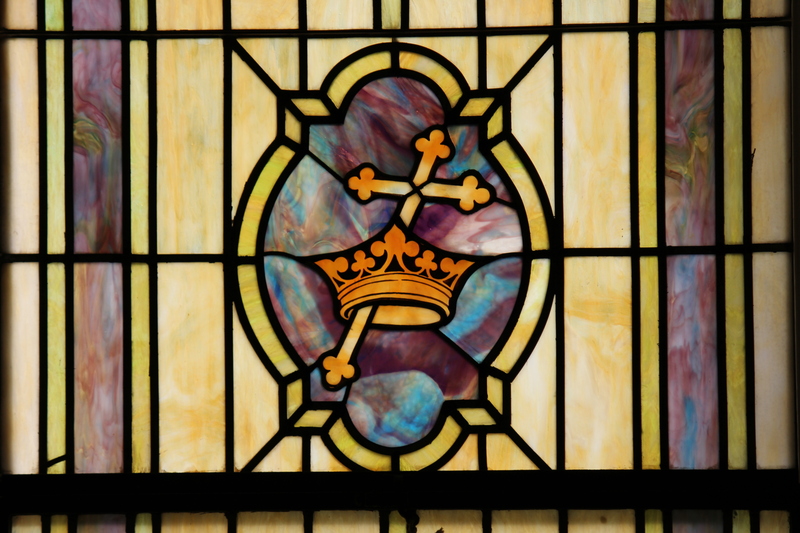 Verse One picks up the Scriptural Theme of the day – Christ the King. This is not just a king or a pretender but the victorious king. The image of the final feast – the wedding feast of the bride (the church) and the bridegroom (Christ) – is put front and center. We have the foretaste of that feast in the Lord’s supper. The church has His presence flowing from His pierced side which verse two picks up on make explicit. I hope you noticed the Alleluias at the end. As a congregation we celebrate the feast with Alleluia one last time before we put them away for a season. In the past I’ve tried to pack as many into a service as possible. This Sunday just these, but still for a purpose. What about Thanksgiving? Two things. Isn’t a feast the central element of American Thanksgiving? The other part is acknowledging where our bounty comes from and asking for providence to continue the blessings. The last verse we will sing does that. 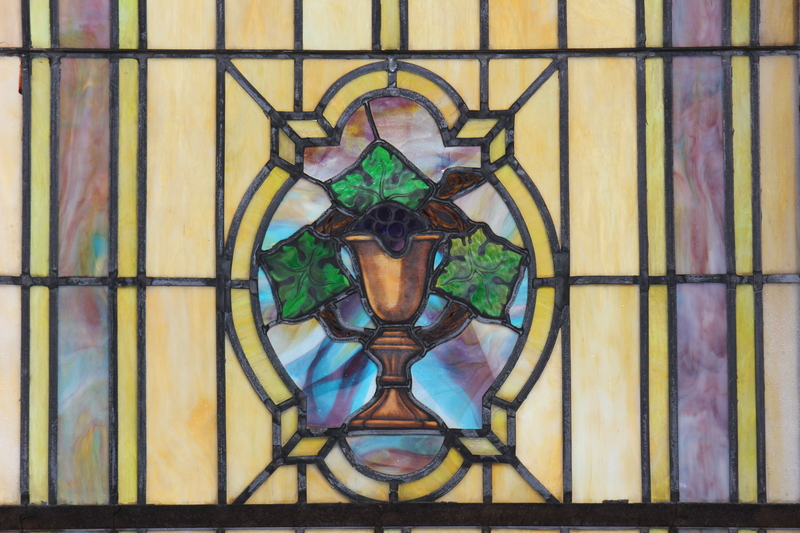 The last verse is a doxology – a hymn of recognition and praise of the Trinity. And this doxology contains that sense of providence – Spirit guide us.